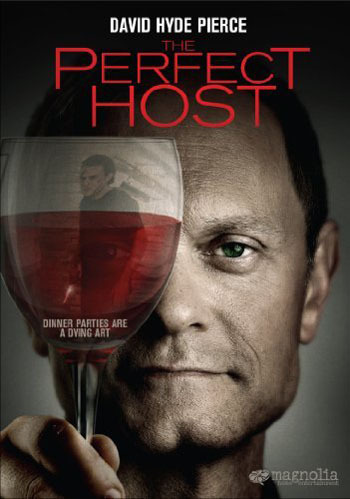 Last night I saw The Perfect Host, a 2010 dark comedy starring David Hyde Pierce. I liked parts of it quite a bit. Some very interesting twists and turns, and a really awesome performance by Pierce. Still, I was left unsatisfied. The ending didn’t make a ton of sense, and big chunks of the story just didn’t agree with each other. A little online legwork reveals a possible explanation: the movie was adapted from a short. This happens more often than you’d think, but I’ve noticed it’s often a recipe for a disjointed film. District 9 is another recent example. I loved a lot of that movie too, but again, the end was a letdown. And looking back, a lot of the beginning feels like filler padding out a much shorter story. I’m not saying it’s impossible to make a successful short-to-feature transition, but I do think it’s a little counter-intuitive to the creative process. If you can tell your story perfectly in 20 minutes, it seems artificial to throw in more scenes just to beef up the runtime. This is damn cool. Watch it fullscreen HD if you can. The Cat Piano from PRA on Vimeo.